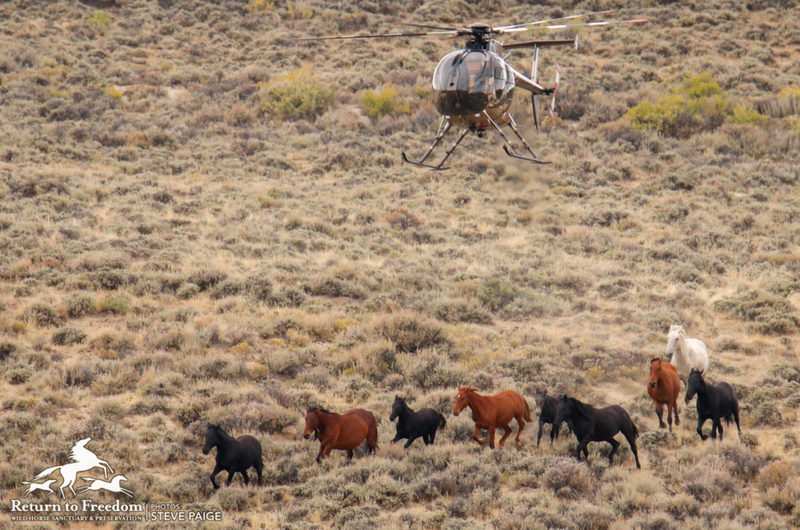 A contractor’s helicopter forces wild horses toward the trap site on Sept. 29 at the Great Divide Basin Herd Management Area in Wyoming. Photo by Steve Paige. 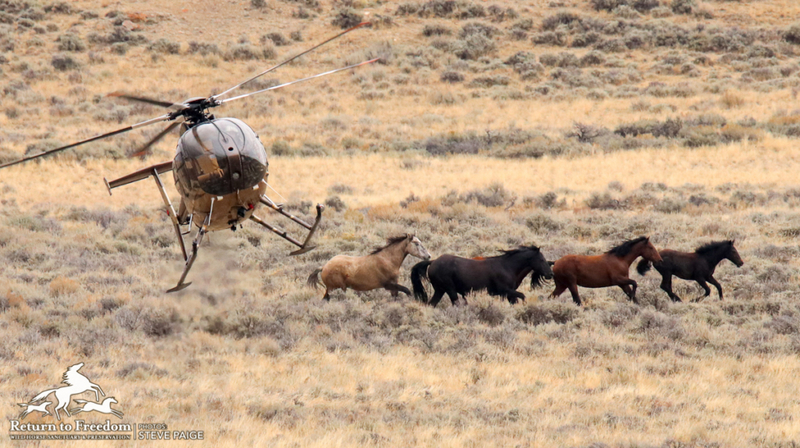 A contractor’s helicopter forces wild horses toward the trap site on Thursday at the Great Divide Basin Herd Management Area in Wyoming. All photos by Steve Paige. 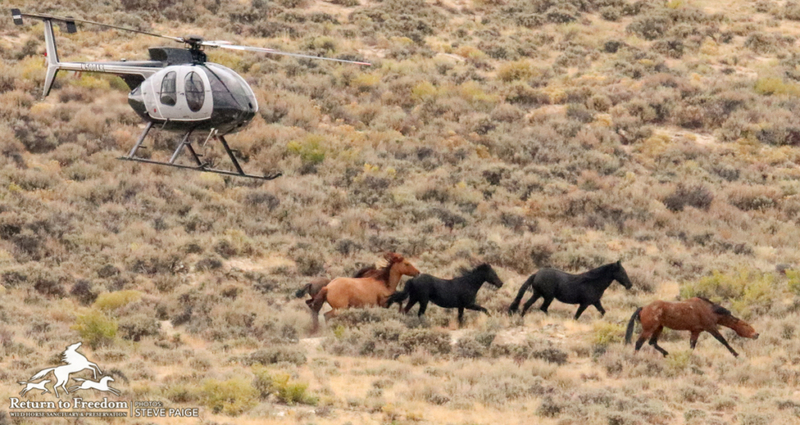 The Bureau of Land Management on Thursday captured and removed 55 adult wild horses from the Great Divide Basin Herd Management Area in Wyoming. That brings to 216 the number captured through four days as part of the the Salt Wells Creek / Great Divide Basin / Adobe Town heard management areas roundup in southwest Wyoming’s Checkerboard region. No injuries or deaths were reported. Four wild horses were euthanized prior to Thursday. Also captured: 10 foals and weanlings, bringing the number captured, so far, to 52. BLM is not counting horses that it removed under 1 year old toward its goal of taking 1,560 wild horses from their home ranges on the Salt Wells, Adobe Town and Great Divide Basin Herd Management Areas. At roundup’s end, 21 mares are to be released after being collared as part of a movement study. The other captured wild horses will be transported to the Rock Springs Wild Horse Holding Facility. They will be offered for adoption. Those that are not adopted will be moved to long-term pastures, according to BLM. and 725 of the 976 in the Salt Wells Creek HMA, which has an AML of 251-365. The HMAs are part of Wyoming’s Checkerboard: an unfenced region alternating blocks of public and private or state land. The roundup is set to take place over a combined 1.7 million acres of public land and 731,703 acres of private land. BLM allows private cattle, sheep and horse grazing on the three Wyoming HMAs equal to 149,962 Animal Unit Months. An AUM is defined as the use of public land by one cow and her calf, one horse, or five sheep or goats for a month. According to BLM, livestock use has been at 39% of permitted levels between 2008-16, with voluntary reductions, in part because of drought. BLM conducted a 2014 roundup in the region after reaching an agreement with a ranching association to remove wild horses from the entire Checkerboard. 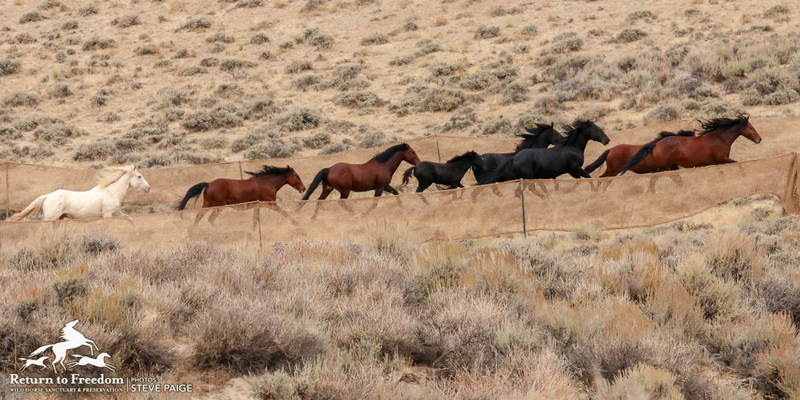 That followed a 2013 lawsuit filed by the Rock Springs Grazing Association demanding that BLM remove wild horses from private ranch land there. 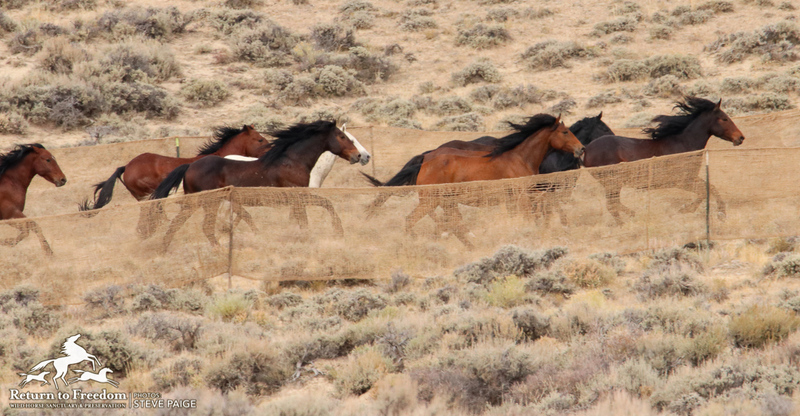 Last October, the 10th Circuit Court of Appeals ruled that BLM violated both the Wild Free Roaming Horses and Burros Act and Federal Land Policy Management Act in conducting that 2014 roundup. The court found that the agency illegally treated public lands as private in its plans. Return to Freedom joined fellow wild horse advocacy organizations and advocates as a co-plaintiff in the case. The appeals court’s ruling resulted in the cancellation of a planned fall 2016 roundup in the Checkerboard, also based on the agreement with the grazing association. Now, BLM is justifying its plans to maintain the HMAs at its minimum population targets based in part on the court’s ruling. To read BLM’s planning documents, click here. Those who wish to view the roundup should contact Tony Brown at (307) 352-0215 or agbrown@blm.gov. Participants must provide their own transportation, water and food. No bathrooms on-site bathrooms will be available. The BLM recommends driving four-wheel drive, high-clearance vehicles.